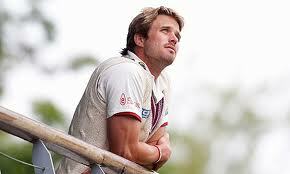 Nick Compton is the first player to score 1000 runs this season. Cricket Depth caught up with him to talk to him about how he is getting on and his hopes and prospects for the future. Do you have any nicknames that your team mates use for you? Which players do you rate highest in the modern game? Jacques Kallis and AB De Villiers. What do you do outside of Cricket, do you do any other sports or hobbies? Yeah, I play a lot of golf, I love photography, I love travelling and I also like writing. That's about it really! Beside your Cricket, do you do anything that your fans might find interesting or perhaps even be shocked at? I do a bit of modelling! After your move from South Africa to England as a teenager, did notice any significant differences in the way the teams train, especially at club or even at professional level? Yeah, I wouldn't say there are differences in the way they train, I think is more a case of attitude. There’s a lot more of a need and want to be a professional sportsman in South Africa than there is in England. For example, the school I was in South Africa, everybody wanted to play professional cricket but when I was in England, I was the only one by a long way who actually wanted to play professional cricket. For me it's a case of attitude. There's more of an emphasis given to sport in South Africa. If you're good at sport in South Africa then that is what you will do while in England sport is just a part of your life and just part of the culture. Especially from your family background with a rich heritage of cricket, did you feel there was some sort of obligation to go down the same career path? No, not at all. I grew up in South Africa and I was a keen sportsman from a young age and that’s not something I could say came from sporty genes or what not, from the age of 5,6,7,8 and 9 I just loved sport. It wasn't as if sport was ingrained because of my family. I love playing every sport, rugby, soccer, cricket, I played everything and wanted to be a professional in every single one of them. Obviously when you grow older and you start having to make decisions, there is no pressure at all, just something I have to transform everyday, basically what I saw, there was nothing to be feel obliged or under pressured to make a career. How did Middlesex go about taking you up and joining the county? I got a scholarship to Harrow School in North London and there is a Middlesex connection there and also my grandfather played for Middlesex. I played for Middlesex Under 15's, 16's and also Middlesex Under 19's, youth stuff, from there I played for the 2nd team. I got my contract in my last year at Harrow School. A guy called Andy Wagner, who was the Middlesex Under 19 coach, really pushed that and I was happy to get a contract with Middlesex. It was my chance to play professionally, something that I always wanted to do from when I was 11/12 years old watching my heroes. What do you think of the public school circuit and how important is public school cricket as a stepping stone for county cricket? I think it is very important. When I was at Harrow, public school cricket was very strong. We had some fantastic players; some very good talent. But comparing it to South Africa, there wasn't a lack of talent, the talent is very much there, I think the major difference between South Africa and England was the attitude of players wanting to go on further. Most of them had rich fathers, happy just to go to the City and go take the evening route. I think training hard to be a sportsman in public schools is almost frowned upon. But I think the public school system is great for cricket, Harrow and Eton play at Lords and against other schools like Charterhouse and all these schools play some fantastic cricket, great grounds to play at so I really enjoyed my 2/3 years in the 1st team I had at Harrow. In your first few years you found some good success, you won the NBC Denis Compton Award and of course named after your grandfather, it must have had been a proud moment for your family? In 2006-07 you were selected to tour Bangladesh with the England A team, did you feel you were close to making your way into the senior side at that point? When I got selected for the England A side, I was happy with my performances and have that recognition. I think once I got there, I was very keen to do well an really loved the environment at Loughborough. I went up to the National Academy, took batting advice with Andy Flower, nutrition/training advice. I wanted to train hard and was enjoying the environment and thought this is where I wanted to be. So when we came back from Bangladesh, I was one of the leading run scorers on that tour. I think it is in my nature to try and push hard and I wanted more of it. I think sometimes when you push too hard, things do not always work out the way you want them to be. When I came back, I scored 70 and 20 in the first game but I got dropped from the team. The captain at the time Ed Smith, dropped me from the team. I think he had a personal grudge against me. But it's one of those things which you have to overcome. At the time, it felt like everything was coming crashing down and maybe things at Middlesex should have been handled better. So yes, at that stage I was keen to push on and get higher on. Since your move to Somerset you've found quite good form and you are now playing with the England Lions, where do you see your future now? Well I've spent my whole life preparing to be a successful Test batsman. I think I can fight hard and bat for long periods of time and play Test Cricket. I will continue on that journey and I think I can achieve that goal and that dream.